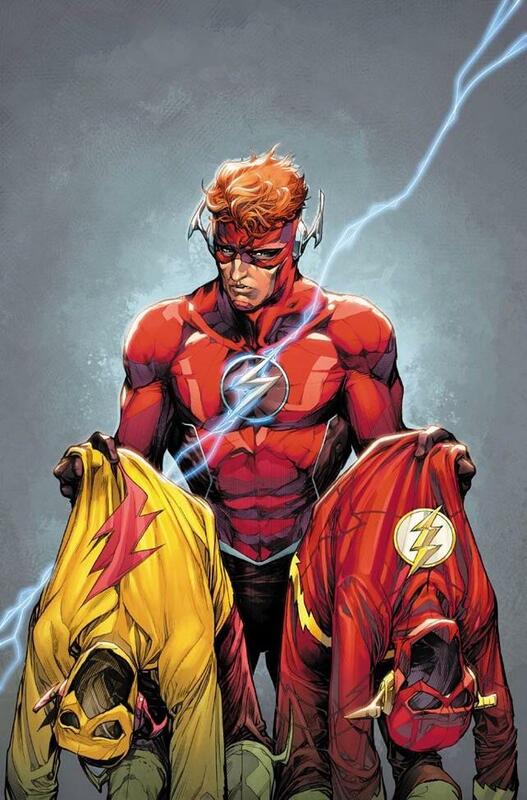 Joshua Williamson focuses on Wally West dealing with a crisis of identity and still unable to find his place in this universe that has gone on without him. The Flash Annual, with art by Howard Porter and Christian Duce, begins in the 25th Century. The Flash Museum has been totaled and the Speed Force damaged across space and time. A group investigates the scenes, finding Eobard Thawne has been murdered and that the timeline has been tampered with. In the present day, the three Flashes thwart The Top in spectacular fashion, while Barry obnoxiously attempts to force Wally into revealing his existence to Iris, in broad daylight. While the trio go to get lunch together, Barry and Wally continue to clash over Wally's decision to keep Iris out of the loop. Wally goes on his own walk down memory lane, meeting up with an old friend and Titans member, Magenta. She initially doesn't remember Wally, but after a touch recalls all of her lost memories including her time as a rogue. In a somewhat expected heel turn, Magenta attacks Wally, blaming him for bringing out her lost memories. Wally takes Magenta to a location from their childhood, bringing her to her senses also expectedly. Meanwhile back in the 25th Century, by the order of The Judge, The Renegades return (introduced in Geoff Johns’ Road to Flashpoint arch) and set out on a mission to retrieve Iris West for the murder of Eobard Thawne. Josh Williamson is playing the long game with this prelude, as Flash War doesn't actually begin until May. However, he does a great job of addressing the elephant in the room since the initial Rebirth special; Wally West and his place in the DC Universe. The use of Howard's Porter's pencils in the 25th Century as bookends for the issue gave the future a very specific look that helped to highlight the different time periods. The second artist on the annual, Christian Duce, has a way of capturing the speed and motion of all three Flashes while in action while also being able to portray high emotion and detail in the slower character moments. Per usual, Hi-Fi absolutely kills it on coloring, adding so much to Porter and Duce’s pencils but most certainly shining brightest in the fight between Wally and Magenta. The dichotomy of the reds and blues truly made the panels pop during their battle. Flash War Prelude was a fun afternoon with Wally West while planting the seeds that will pay off for readers in the months to come. With Wally back in Keystone city, Williamson is bringing the character back to form one step at a time allowing him to a place of his own in this world. The last page reveal alone will keep readers speculating as the countdown to Flash War continues.